Complete your profile by following the instructions to create your email address and password, if it's not already done. After this step, you have access to download your digital edition of RICARDO magazine. 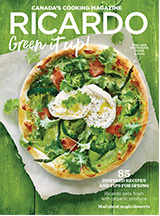 You now have access to the digital edition of RICARDO magazine. Enter the email address and password that you created during the purchase of your digital subscription. After this step, you will have access to the digital edition of RICARDO magazine.